When thinking of Indonesia, I’m sure supervolcanos, death caves and royal tea parties don’t quickly come to mind. But, as the 4th most populous country in the world, with over 300 ethnic groups scattered across 14,000+ islands, culture in Indonesia is way more diverse than you might think. Sure, most know the country best for being an Instagrammable paradise of sun, surf and beach, but beyond that, Indonesia happens to be a glittering treasure trove of mindblowing culture (and maybe just a few crazy surprises). I’d like to think of Indonesia as a picture-perfect backdrop for some of the world’s most interesting cultural traditions. And sure, it’s always fun to snap candids with your smoothie bowl or flex strategically in front of waterfalls, but Indonesia is about way more than that! The country is not only pretty, its fascinating cultural foundation gives it a distinct vibrancy that makes it one of the world’s top destinations. So here’s what I say: venture beyond the paradise aesthetic to explore the culture of Indonesia, and I promise you’ll be blown away. Wondering what to do in Indonesia culture-wise? Here are some of the cool experiences to try out on your next trip. NOTE: This list is based on a short 10 days I spent in Indonesia as part of the Ministry of Tourism’s #TripOfWonders campaign, and I know I’m missing plenty of cool experiences! Where should I go the next time I visit Indonesia? Share your favourite cultural sights with me in the comments, and click here for a more thorough list of Indonesia’s cultural wonders. … So maybe it’s not your typical ‘sun vacay’, but for those who dare, it’s probably one of the most interesting cultural sights you’ll ever see. 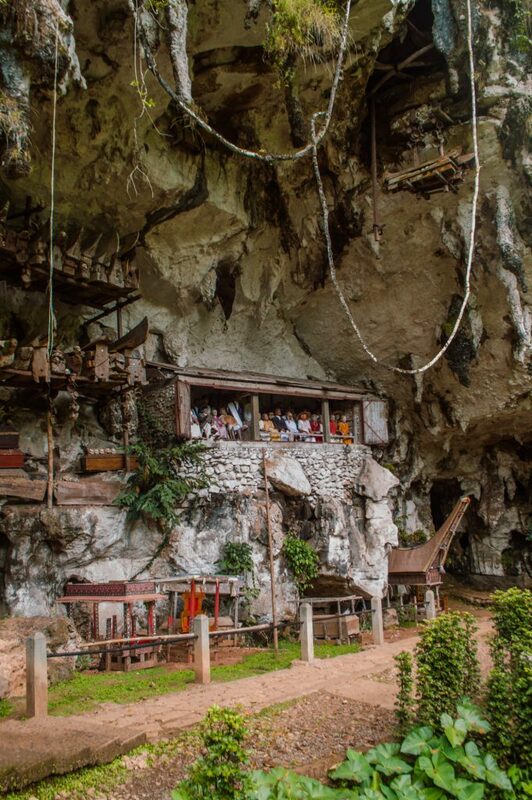 The fascinating death rituals of the Torajanese have become a magnet for curious tourists around the world, who flock to the highlands of South Sulawesi each year to observe these traditions for themselves. 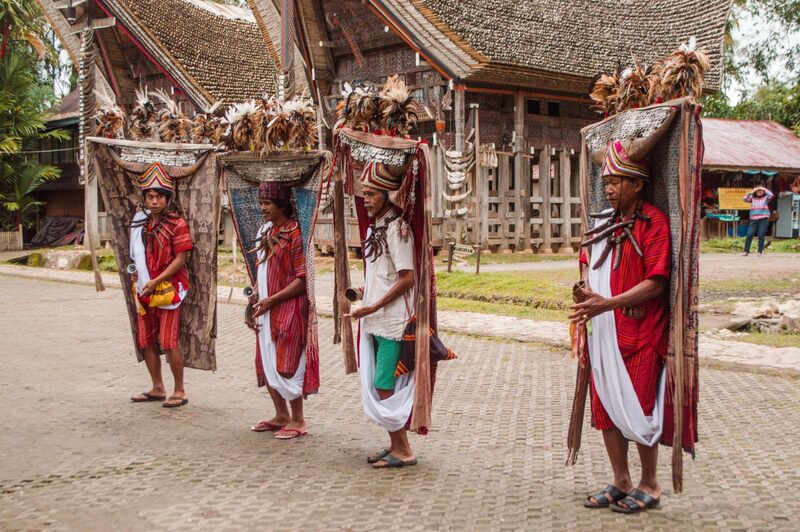 Here in Tana Toraja, death is celebrated even more than births or marriages, which is why their funeral ceremonies are among the world’s most extravagant. Suggested activities: Visit Londa and go for a guided tour of the cave cemeteries. Foolishly fearless adventurers can even choose to go in solo, with oil lamps available to rent if you’re so inclined. While in the area, also be sure to stop by Kete Kesu, a beautiful ancient village set among rice fields. Planning your visit? 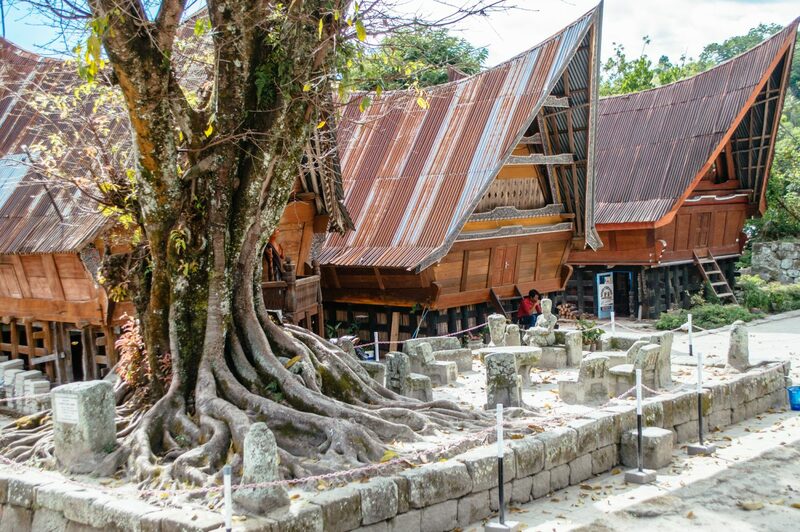 Here’s a full in-depth guide on visiting Tana Toraja. Created from the eruption of a supervolcano about 70,000 years ago, North Sumatra’s Lake Toba is truly a sight to behold. Besides being the world’s largest volcanic lake, Lake Toba is also erupting (sorry – bad pun) with a fascinating culture and history. As home to the Batak people, one of the largest Indonesian ethnic groups, a trip here is a chance to immerse yourself in amazing detail-oriented architecture and learn about the intricacies of Batak culture in Indonesia, including their wonderfully complex system clan system (their means of socio-political organization) and strong emphasis on kinship. Suggested activities: Visit Samosir Island, an island the size of Singapore in the middle of the lake. Here, you can explore the TB Silalahi Centre, a museum showcasing fascinating artifacts from Batak culture and also stop by the ancient village of Huta Siallagan, where you’ll be able to spot traditional Batak houses and see a Hariara Tree, considered by the Bataks to be sacred. PS: Lake Toba is considered to be one of the top alternative destinations in Indonesia. Click here to see some others! One of Indonesia’s most popular cultural exports is batik, a fabric seen all around the country, often in Indonesian traditional dress. Batik comes in all colours, patterns and sizes, and is created by tracing designs with wax and then dyed to produce impressively intricate patterns. 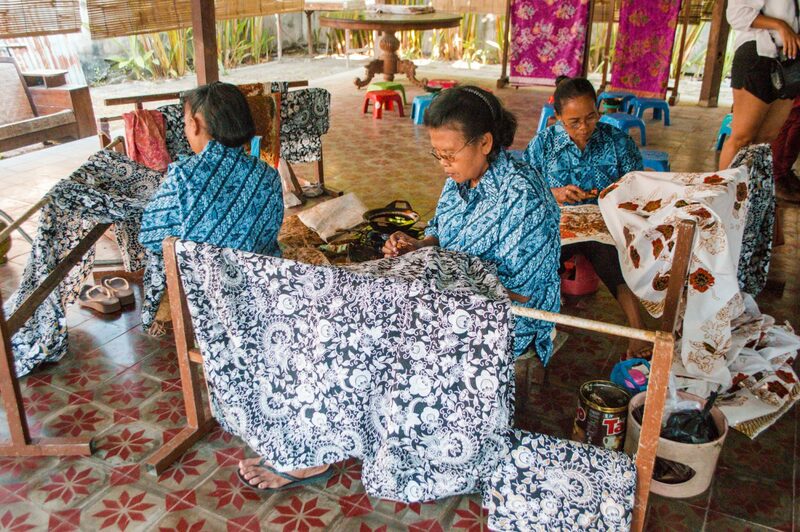 From touristy gift shops to swanky upscale boutiques, you can find batik pretty much anywhere in Indonesia, but Java is where it originates, and there are plenty of amazing opportunities to see it getting made. Suggested activities: Swing by the beautiful Museum Batik Danar Hadi, with a stunning collection of batik to swoon over, then be dazzled by witnessing first hand how it’s made! FYI, to get a real grasp of how impressive their work is, you should try a batik workshop to see just how tough it is to get these patterns done correctly! Spoiler: My attempt was a sad abomination of batik artistry. 4. Absorb and learn about indigenous Indonesian culture and traditions through dance. One of the coolest ways to observe the cultural differences among different parts of Indonesia is by watching traditional dance. From the slow, graceful movements of the Javanese peacock dance to the lively rhythm of Si Gale Gale and Tor Tor dance in North Sumatra, there are literally thousands of dances to watch among the many Indonesian ethnic groups (and of course, ones you can try yourself, if you’re brave or drunk enough). My personal favourite? The Torajanese dance photographed below in Kete Kesu. I mean those headdresses are some next-level badassery. 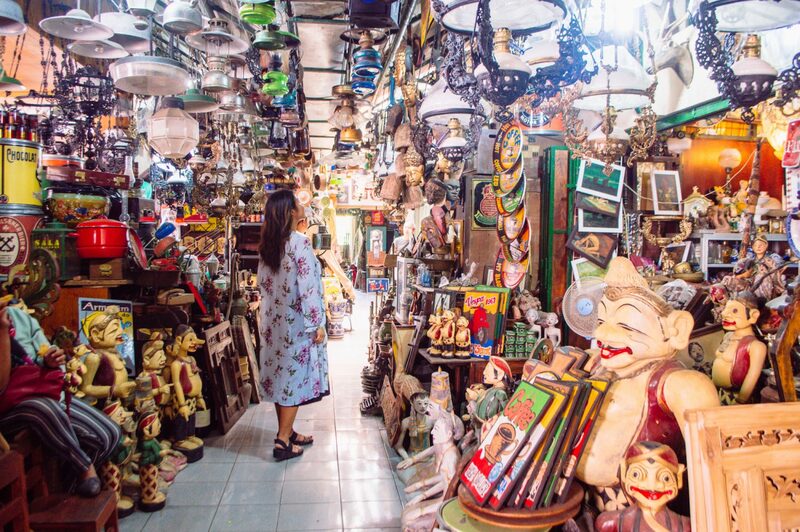 There’s no better way to experience local culture in Indonesia than to throw yourself into the mix with locals themselves, and markets are a fun peek into local living, whether you’re rummaging through antique markets for Indonesian arts and crafts or simply hoarding snacks and groceries to fuel your travel days. 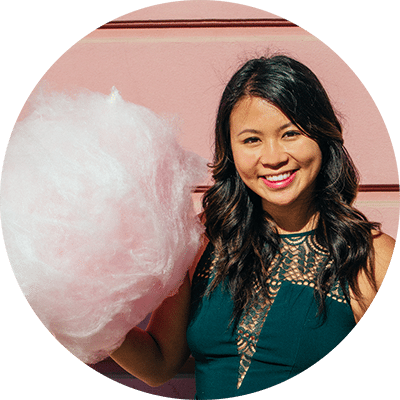 Luckily for visitors, Indonesia is packed with markets of all kinds, and most importantly, plenty of regional treats to satisfy any palette (but mostly sweet tooths!). Indonesian food culture is wickedly diverse, so bring your most daring tastebuds and of course, stretchy pants. Suggested activities: Wake up early one day and throw yourself into the bustle of a local market, then promptly eat everything in sight (aka Indonesian food culture research). The best way to get insider info on markets to visit is by asking around. If you happen to find yourself in Surakarta (AKA Solo), its world-famous Pasar Gede is a must for foodies. Here’s a video from my friend TJ of all the deliciousness you can expect! PS: The Triwindu Antique Market is also super cool, especially if you love hoarding useless trinkets like me. While well known for its stunning variety of temples, there is no one official religion of Indonesia. In fact, the country actually has six official religions, which means it boasts its fair share of beautiful churches, mosques and other places of worship (alongside the temples that haunt your Pinterest boards). Of course, the country’s religious diversity has manifested in a visit-worthy mix of different temples and religious sites, many of which openly invite visitors to come in and learn more about the many religion(s) of Indonesia. Suggested activities: The list of must-sees is way too long, and dependent on where you choose to spend your time in Indonesia, but some of the most popular experiences include bathing in the holy waters of Tirta Empul in Bali, visiting central Java’s Borobudur (the world’s largest Buddhist temple) and soaking in the grandeur of Jakarta’s Istiqal Mosque (the largest in Southeast Asia). FYI, there’s an even a “chicken church” in central Java. So, I’ll end by stating the obvious: this post barely scrapes the surface of everything that culture in Indonesia has to offer! The amount of cultural diversity in Indonesia is huge, and truthfully, the culture of Indonesia is one that would take ten lifetimes to explore. Still, this list is a nice starting point to learn about some of the Indonesian culture and traditions that make the country such a fascinating one to explore. The best way to learn more of course? Well duh, to go see for yourself! So tell me: which of these experiences would you be most keen to try?! And what am I missing from this list? Let me know in the comments! I was welcomed to Indonesia as a guest of the Ministry of Tourism as part of their #TripOfWonders campaign. All words, photos and experiences however are my own ☺This post also contains affiliate links that come at no extra cost to you, but help keep the site (and my guacamole addiction) running! Thanks as always for your support. I think I’ve only been to Indonesia once or twice when I was very young. My parents prefer Thailand but it looks like I’d have to go back myself one day! The culture there is so amazing! hahah it’s great to have a balance of both, I say 😉 Thanks for reading!! I didn’t know much about the cultural stuff either before my visit. Super interesting and eye-opening! I love this list! I found Indonesia to be culturally fascinating, but I feel like I barely even scratched the surface (I only visited Java and Bali). I’m already planning to go back so I’ll have to keep this handy for next time! Actually, supervulcanoes is exactly what I think about, when hearing Indonesia 🙂 I once did a trivia game on this topic and also have seen so, so, many traveler pictures about hiking and seeing all the smoking volcanoes that it is exactly what I want to do there! While Bali probably is the “cashcow” of tourism for Indonesia, I’d probably go elsewhere just to avoid some of the crowds. Definitely on my list to visit! hahah then you’re special 😉 And yeah I mean, Bali is amazingly beautiful so I see the appeal, but it just bugs me when people assume the rest of the country isn’t worth seeing. Thanks for reading, and YES I agree, hiking around the volcanoes would be sooo cool. Thanks for such a fun and informative read! Indonesia is such a big country, visitors really shouldn’t stick to the tourist hotspots like Bali. My parents actually went to Lake Toba for their honeymoon many years ago! As a Singaporean, it saddens me that I haven’t explored this neighbouring country in any detail at all – just a couple of short trips to Jakarta, Bintan and Bali (of course). Pinned this post for future travel ideas! What a sweet place for a honeymoon!! and nahhh don’t be sad. I think it’s the same for everyone. Up until recently, I had never travelled around Canada (my home country). We tend to gravitate towards places that are farther and ‘more exotic’ (aka different from where we grew up) haha. Thanks for reading, and I hope you get to visit Indonesia again soon! No problem, Sandy!! I don’t blame you. I always assumed Bali was its own country (ackkk so ignorant, I know!!) It was gorgeous and I can see why it’s so popular, but there’s really so much else to see as well 🙂 thanks for reading! Indonesia is a paradise on Earth, in my opinion. This is one of the best places that a person can visit. There is an amazing culture there. I want children to grow up there with good education and prospects. But the location is beautiful. I couldn’t agree more <3 Thanks for reading! Hey, thanks Christina for this informative article. I love this country. I can suggest you to visit Dieng Plateau in Central Java. Also, there are so many intertesing things to do around Bandung city (capital of west Java). If you have time do check out our travel videos on Indonesia, I reckon you will love it. Cheers! Keep up the good work. Thanks for the great post! Very unique and interesting experiences. I will certainly follow this list to try for my next vacation to Indonesia in October.